Pioneer Auctions is the official auction partner of Dubai Customs for major auctions of goods and assets not been cleared by their proprietors within the permitted period. Pioneer Auctions is more than just a vehicle auction house. Our services include property auctions, building and construction material auctions, large machinery, horses, jewels, charity and general materials. Got something you need to auction? 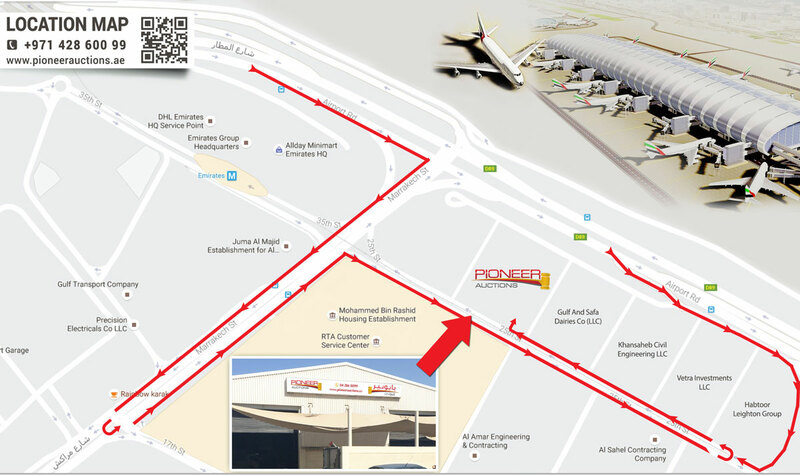 Pioneer Auctions, United Arab Emirate's Leading Auction House. Operating for many years in Dubai, we are today recognised by our customers for providing outstanding customer service and delivering on our promise of 100% Customer Satisfaction. Pioneer Auctions delivers comprehensive solutions that make Auctioneering more profitable and successful for all our customers, with physical auctions, Live online bidding, Internet bidding, logistics services, preparation of auction items and much more. Pioneer Auctions is holding the next Dubai Customs Live Auction. You can find the location of the Pioneer Auctions showroom on the map below.